We named this cam for its purpose. A noticably aggressive sound, with top end power nearly as much as our Strip camshaft. 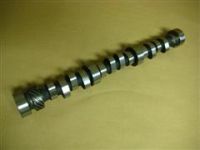 We use Comp Cams 26986 springs with this camshaft. Custom length pushrods are most likely necessary for proper lifter preload. Milling the head and/or thinner head gaskets may negate this. We cannot say how much will be neccessary until each camshaft is made. Please allow 2-3 weeks for the cam to be made. To hear what this cam sounds like in a mostly stock 3400, check out these videos.